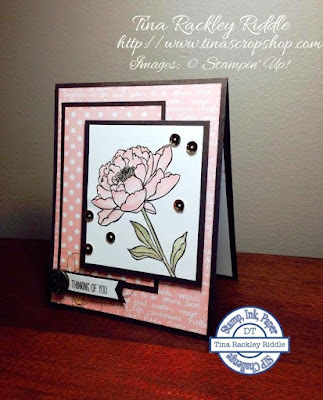 Tina's Crop Shop: SIP #20 Color Challenge - You've Got This! SIP #20 Color Challenge - You've Got This! Hello and Happy Happy Tuesday! I'm scheduling this post as by the time this one goes live, Jeff and I will be in Half Moon Cay, Bahamas. I'm really looking forward to a vacation. It's been a busy year and we haven't had a chance to chill out in some time! 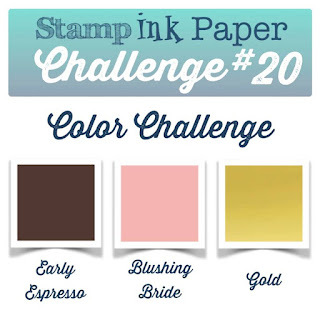 This week's Stamp, Ink, Paper Challenge is a color challenge! I have always loved pinks and browns together and throw in a little bling and you have perfection! When the Annual Catalog came out earlier in the year, I was on a "You've Got This" stamp set kick. Well, here I go again. Here's my take on this week's color challenge! This week's card is a simple layered card. I started with an 11" x 4 1/4" Early Espresso card base scored at 5 1/2".I added layers of the Blushing Bride DSP from the Subtles Background Collection first on my cardbase, and then another pattern mounted on more of the Early Espresso cardstock. I stamped my flower image from the You've Got This stamp set in Early Espresso on Whisper White. I quickly cleared embossed the flower image and then watercolored the flower in Blushing Bride Ink with Mossy Meadow and Old Olive for the stem and leaves. I used gold stickles on the center of the flower and mounted the panel on more Early Espresso and popped it up on my card with dimensionals. I added some Pretty Pink Posh gold sequins. I wanted a small sentiment for the outside so I used the "Thinking of You" portion of the sentiment that actually says "Thinking of You at Christmas" from the White Christmas stamp set. I used my banner punch to punch the end of the sentiment and adhered it with Dimensionals over some Gold Metallic Thread. I added an Antique Gold Brad to the end of it. This was a super simple card but really looks pretty. Sometimes I need to remember that simple is not always a bad thing. I tend to overthink my cards at times! Such a beautiful card, Tina! I love how you stamped the floral image in Espresso before coloring it in. Embossing it was a great idea.